Bruce Springsteen elected Barack Obama: The strange confluence of Sandy, Snooki, Christie, Bruce, and Barack. Sandy, Snooki, Christie, Bruce, and Barack. I know we are supposed to believe that poll analyst Nate Silver was “the other winner” on Election Day—the mythic figure whose stature was most enhanced by this election. And there’s truth to that. But I’d like to propose another candidate for “the other winner,” another mythic figure who—a case can be made—didn’t just predict the victor but helped create the victory. I’m talking, of course, about Bruce. Need I say the last name? 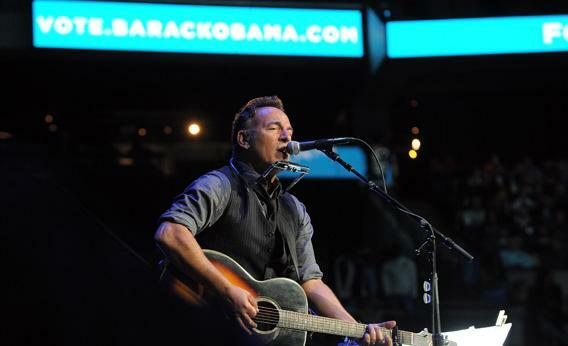 Springsteen’s contribution to Obama’s victory has been, I believe, underrecognized and underappreciated. So think of this as a personal thank you to Bruce. He’s a figure whose work I’ve loved and struggled with for a long time. (I love the mixture of dread and exhilaration his music evokes; my faves include “Atlantic City,” “Darkness on the Edge of Town,” “Tougher Than the Rest.” I worry a bit about some of the anthemic bombast.) But I’ve always found appealing the original doomy vision that underlies his work, the genesis of his sensibility, his portraits of the sad, seedy romanticism of the Jersey shore (long before Jersey Shore). And so I was stunned by the fateful confluence of Sandy and Christie and Bruce and Barack just days before the election—a confluence that may well have decided the election. I started thinking about this on a kind of mythic level when the narrative of Sandy’s political effect (as opposed to its tragic, shore-level devastations) began to unfold. Is it not one of the weirdest coincidences that this wicked hurricane was given the name Sandy before anyone knew it was destined to virtually target and devastate the Jersey shore? A Jersey shore whose pre-Snooki muse was an elusive boardwalk goddess named Sandy, immortalized in the Springsteen song “Fourth of July, Asbury Park (Sandy)”? Who could have known then that Sandy (the storm), after heading up the Atlantic coast of the United States, would stop and take that sharp left turn, smashing into the boardwalks and beach towns of the Jersey shore that Bruce had celebrated and mourned? Thereby summoning Barack Obama into the arms of Chris Christie, Chris Christie into the arms of Bruce Springsteen, just when Springsteen was summoning the hearts of those all-important undecided voters in Ohio and the Midwest to Obama? Not even Nate Silver could have predicted all that. After all, hurricane names are chosen long before the hurricane season by the World Meteorological Organization, and Sandy just happened to be next up alphabetically. It could just as easily have been called Raphael or Tony, this year’s R and T names. Sandy—the elusive, iconic Jersey girl—appears on Bruce’s album, The Wild, the Innocent & the E Street Shuffle. “Fourth of July …” is a song that evokes in a strained but heartfelt way the poignant and seamy, the doomed wild and innocent romanticism of the old Jersey shore. 4th of July, Asbury Park (Sandy)” was written in mid-1973. In his 1998 book Songs, Springsteen wrote: “I’d been evicted from my apartment above the beauty salon, so I moved on myself and was living with my girlfriend in a garage apartment, five minutes from Asbury Park, in Bradley Beach. This is where I wrote ‘4th of July, Asbury Park (Sandy),’ a goodbye to my adopted hometown and the life I’d lived there before I recorded. Sandy was a composite of some of the girls I’d known along the Shore. I used the boardwalk and the closing down of the town as a metaphor for the end of a summer romance and the changes I was experiencing in my own life. Needless to say he couldn’t know when he wrote “Sandy” that his beloved boardwalk was not only in sad decline, but that it would later be revived as a theme park for the most noxious elements in American culture, a kind of puke-spewing, reanimation of the worst of the past and present marketed as “reality.” He couldn’t have known Sandy would be replaced by Snooki. Could it be (on a mythic level, anyway) that Sandy (the malevolent storm) was like a wrathful goddess cruelly and pitilessly smiting the shore that had given her birth and abandoned her for Snooki, the pugnacious self-tanner who turned the Jersey shore into Jersey Shore? Obviously, I’m speaking metaphorically here, not literally. But it’s worth considering in a little more detail the role Sandy (the storm) and Bruce (the singer) played in the final days and hours of President Obama’s campaign. With all the momentum still seeming to be on Romney’s side a week before the election, Obama flies up to the Sandy-stricken Jersey shore, where he’s embraced by GOP Big Man Chris Christie, whose effusive gratitude for the presidential visit and promised assistance dominates the national media for several crucial days, stomping out any “Mittmentum” that might remain as Romney is relegated to handing out canned food in obscurity. Several more days are then devoted to analyzing what it all meant. Some exit polls show that 40 percent of voters felt that Obama’s hurricane response—or what they saw of it—was an important factor in their vote. Quite simply, what Bruce was doing was winning the election for Obama by playing a tireless marathon series of free concerts that drew crowds for the president in Ohio and Wisconsin—the imperiled Rust Belt “firewall” of Obama’s electoral strategy—state contests that most pollsters agreed depended on whether Obama could attract just enough white, male, working-class voters (even if far from a majority) to his coalition. The white, male, working-class voters who are the heart of Springsteen’s fan base. And who, it seems, must have been open to an appeal from the Boss (I know, I cringe) to overlook their reservations about a black president and, essentially, vote for Bruce. Perhaps the choice was designed to remind voters that this time would be different. This time we really would take care of our own. Indeed, in the final days, with Bruce riding around with Obama on Air Force One, it was almost as though he was on the ticket, Obama’s spiritual VP. Or at least ambassador from Asbury Park. (Indeed, it makes you wonder if Bruce has a political future.) And the concerts and especially that song—the guy knows how to go straight for the heart, like a laser-guided drone. He knows how to make you feel, for at least an instant, we could all be better than we are. That’s a talent. And with the election coming down to the last minutes, the last few votes, it can’t be insignificant that the demographic of attendees drawn to Obama campaign events by all those free Bruce concerts was the heart of the heart of the undecided voter segment that would eventually give Obama the election. After all, once you consider that Obama won Ohio by fewer than 2 percent, don’t try to tell me the combination of Sandy, Christie, and above all Bruce wasn’t the decider. In fact the Wall Street Journal post-election analysis of the Ohio vote put Obama’s margin in swing counties in Ohio at 16,176—about the total for a couple of small Bruce concerts. What was it about Bruce that gave him the power to confer authenticity on his candidate after all these years as a showman? You have to admire it. Something about his earnestness—which can get a little overbearing—is real. As someone said, “Once you can fake sincerity, everything else is easy.” The line is often misinterpreted, thought to be about masterful phonies. But it’s actually about the difficulty of faking sincerity. I’m not saying sincerity is the highest artistic virtue, but I don’t think Bruce’s sincerity can be faked. We’re all sensitive to fake sincerity these days. Reality TV sincerity. Jersey Shore sincerity. But I’ve always had the feeling that that was the essence of Bruce’s genius. If overearnestness was his downside, it was his upside as well. The question of sincerity and why Bruce made the difference—OK, a key difference—in the final outcome brings us to the Romney and Snooki connection and the self-tanning controversy. It will be little noted nor long remembered, as some previous president once wrote, that Mitt Romney—when asked, long before Sandy, who was his favorite pop culture icon (between Snooki and Honey Boo Boo)—claimed that he really liked Snooki (“so energetic”), making it seem as if he were a regular, Jersey Shore-watching guy. I’m serious. Has there ever been a more transparent and contemptible lie? Sure, it’s a minor point. But it’s contemptible because it displays (like the 47 percent line) Romney’s contempt for the “little people.” Throw them a name from their vulgar culture and they’ll eat it up on the food-stamp lines. He thinks ordinary people are so stupid they’d actually believe he and his wife and maybe his “dancing horse” (as Snoop Dogg, among others, memorably called the steed) sit down together to watch Snooki and the Sitch. Give me an effen’ break. The nature of this inauthenticity, this shallowness, is so deep it’s almost fathomless. Couple that with another forgotten pre-Sandy campaign controversy: Does Romney use self-tanner, as this Jezebel roundup suggests? Or is it just “full makeup,” as this Times story euphemizes? And I think that’s where Bruce’s championing of Obama comes in. For just enough of those voters, the doubting ones, the election of the president became a choice not between Obama and Romney but between Bruce and Romney. You know who won. Thank you for your work, Bruce.